UrbanVibe has recently started the transformation of their latest condominium project, 1700 Q Street. This magnificent mansion in the Dupont Circle neighborhood epitomizes the grand Row Houses designed and built by Thomas Schneider between 1889-1892. 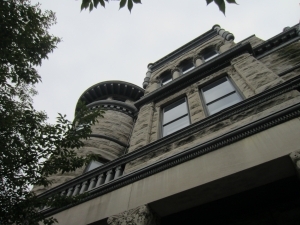 Listed on the National Register of Historic Places, this beautiful architectural wonder will be transformed into 4 stunning flats ranging from 1220 to over 1600 SF of conditioned and private terrace and rooftop space. Contemporary, modern and stunning describe the look that these exclusive apartments will embody. The incomparable location warrants a 100 Walk Score because of its proximity to restaurants, stores, coffee shops, pharmacy, and grocery. To view more of this condominium transformation and the Dupont Circle neighborhood, check out the video gallery.